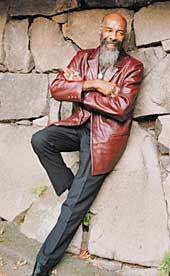 Richie Havens is gifted with one of the most recognizable voices in popular music. His fiery, poignant, always soulful singing style has remained unique and ageless since he first emerged from the Greenwich Village folk scene in the early 1960’s. It’s a voice that has inspired and electrified audiences from the Woodstock Music & Arts Fair in 1969, to the Clinton Presidential Inauguration in 1993 -coming full circle with the 30th Woodstock Anniversary celebration, "A Day In The Garden", in 1999. For over three decades, Richie has used his music to convey messages of brotherhood and personal freedom. With more than twenty-five albums released and a touring schedule that would kill many a younger man, he continues to view his calling as a higher one. As he told The Denver Post, "I really sing songs that move me. I’m not in show business, I’m in the communications business. That’s what it’s about for me". For Richie Havens, making music is a continuous journey, and one that advances a step further with each album. "My albums are meant to be a chronological view of the times we’ve come through, what we’ve thought about, and what we’ve done to grow and change. There’s a universal point to which we all respond, and where all songs apply to everyone".